Trade Microcap Stocks With REAL Potential (not pump and dumps) To Quickly Grow A Small Account! INSTANT ACCESS TO TRAINING MODULES + 1 FULL MONTH OF BUY/SELL ALERTS FOR ONLY $97! Weekly picks with entry and exit alerts/zones, so there's no guesswork on your part. Short, Medium and Even Long Term picks with explosive upside. Taylors to both the short term trader and longer term investors. Technical analysis explained on each pick, as well as fundamentals behind each stock. So you know exactly what the story is behind each pick, and can learn as you go. Watch list of stocks for potential new picks so you can see what may be next. BONUS! 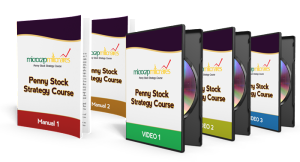 Instant access to Penny Stock Strategy Course, located in the members area available to you even if you join at 2 a.m.! Stocks from 1 penny per share to $1000 all move higher when certain "tells" present themselves. Similar to how pro poker players spot these "tells" at the poker table that lead them to big payouts, we spot them in stocks (mostly small/micro cap). When played correctly, these "tells" can lead traders to singles, doubles and even the home run trades that many people dream of. Charting/technical analysis have their place, but what really propels stocks to make big moves is specific pieces of information. These specific nuggets ("tells") of info are what we scan the market every day for, and when we do, we promptly alert our subscribers so they can profit. These "tells" can be something as simple as a new, well respected CEO taking the reigns of a struggling company (such as Marissa Mayer taking the CEO spot at YHOO) or something more complex such as a game changing earnings announcement that propels a small cap stock higher for days, weeks, and sometimes many months (such as when VIPS started reporting high growth in earnings due to a new flash sale model). Disclaimers: Most people that trade stocks and options end up losing money and quit, including those who subscribe to any services of MM Publishing Inc. I don’t think this has to be the case for everyone, so I present my research to my subscribers to help increase their odds of success. However, I have not scientifically quantified that increase, and it would require laborious research from my customers that frankly I am not capable of gathering, analyzing and presenting. 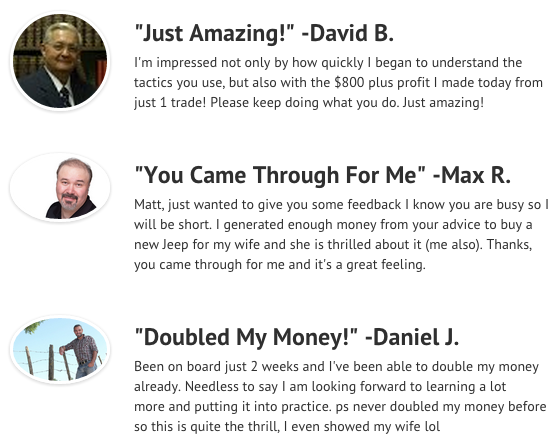 Testimonial examples shown are authentic feedback from subscribers to this service. However, their claims have not been indepently validated nor verified. No one has been compensated to give any sort of testimonial or feedback. Past performance is not necessarily indicative of future results. Seeking Alpha, Yahoo finance, Google finance and Investorshub logos are displayed simply to reflect that we have published or have had links to our published content on these sites at different times. No endorsement or partnership is implied.